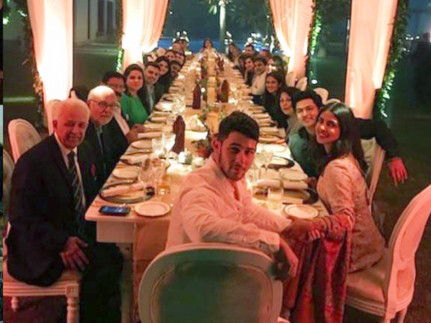 Ahead of their wedding, actress Priyanka Chopra and American singer Nick Jonas celebrated Thanksgiving with their families in Delhi. Chopra on November 22 took to Instagram, where she shared a photograph of herself along with Jonas and their respective families at the dinner table. The couple could be seen holding hands, while posing for the camera. The singer arrived in the Indian capital earlier that day. As the actress is currently shooting for her upcoming film The Sky is Pink here, she personally welcomed the pop singer and later posted a photograph with him on Instagram. It has been reported that Chopra will tie the knot in December at Jodhpur, Rajhastan’s grand Umaid Bhawan Palace. Wedding details, including the official dates, have been kept under wraps so far, but according to those in the know of developments, it will be a close-knit family affair and a separate celebration for her film fraternity friends will take place later. The actress came to India to resume shooting for The Sky is Pink after enjoying a bridal shower in New York and then a bachelorette party in Amsterdam and Italy. Chopra and Jonas had a traditional ‘roka’ ceremony in August at the actress’ Mumbai residence.